Hey! My name is Carlyn Smith, store manager of the Virginia Beach Music & Arts. I was born and raised in Virginia Beach where I have been very active in the local music community. 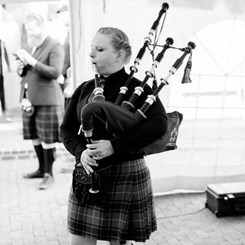 I started playing music at age 8 when I began taking bagpipe lessons. I have played in a few different local pipe bands over the years, and I currently play with the Newport News Police Pipes and Drums. In middle school I started playing the clarinet, and then got switched to bassoon…for a week. But unfortunately I was too small to play bassoon, so I was switched to oboe. I am a graduate of Kempsville High School, where I played oboe in wind ensemble and played tenor sax for our jazz and marching bands. I graduated from OldDominionUniversity with a degree in Music Education and Oboe. While in college I played both oboe and English horn in the wind ensemble, orchestra, and several chamber groups; where I was able to play in venues such as Carnegie Hall and the KennedyCenter. I also played tenor sax in the pep band for the ODU basketball teams, such as the Lady Monarchs. I started my Music & Arts career in the fall of 2003 at our Kempsville Music & Arts location. I held many positions throughout the years starting as a rental temp and working my way up to manager. I have worked at a few of our different southern Virginia locations including; Kempsville (rental temp, full time), Chesapeake (full time), Great Bridge Express (manager), and finally Virginia Beach (manager). Our store is set up to assist you with any of your musical needs from purchasing instruments, sheet music, and accessories to lessons and even string instrument repairs!